Anyway, turns out Borneo’s an island, and we spent a week there in February. The biggest island in the world apparently (that’s another thing – how big does it have to be before it’s a continent? I mean, isn’t Australia the biggest island in the world? It’s not a continent, so what is it?) but, if I’m honest, I still don’t really know where it is. OK it’s an ape, not a monkey but the word monkey, well it’s funnier, isn’t it? Like I said this isn’t a wildlife documentary. If you want accuracy, go see David Attenborough – here you get the funny. Whilst there we decided to visit a tribal village in the heart of the rainforest, and some indigenous tribes. Well, I say a tribal village; it was more like a film set really, all newly built huts created in the style of old huts, and a bunch of actors dressed up as tribes people. Several tribes were represented in this little clearing tucked away in the unending forested valleys, from peaceful tribes who specialised in various t types of home brewed wine and foods (very enjoyable and the drunkest I’ve been at 11am since university), to the much-feared and until frighteningly recently still practicing head-hunter tribes, whose notoriously violent members were lurking in the bushes to jump out on us as we wandered through the huts (don’t worry nobody died, they were actors). I even shot a two meter blowgun with a poison tipped dart (OK it probably wasn’t poisoned). For reasons known only to the Koreans who in our party who were pointing at me, giggling, I was chosen to be our ‘chief’ to stand face to face (well, chest) with their angry looking and spear-wielding chief (don’t be scared, he’s an actor). There were several rules I had to adhere to upon meeting him, or face certain death (not really – actor, remember?). One, I had to look him in the eye at all times, or I would lose my head. Two, I had to refrain from all sudden movements, or I would lose my head. Three, I could not smile, or even smirk, or I would lose my head. In the words of Rory Breaker from the film Lock, Stock & Two Smoking Barrels “ you’re gonna have to work very hard to stay alive, Nick.” So stand still I did, looked him directly in the forehead – sorry, eye – and rrefrained from grinning for fear of suddenly finding myself one foot shorter (actor). It was all a bit of fun and you will be pleased to hear that nobody, not even me, lost their head to a diminutive actor dressed up as an indigenous tribesperson; all of whom were mightily impressive and convincing and actually traced their roots back to the tribes they were portraying. What I did find interesting though, with my How Not to Get Hit hat on, was the ritual involved in a new person meeting the tribe; all of which have very clear links to modern approaches to managing aggression and violence, or at least avoiding violent miss-understandings when meeting new people. I mean, we all get annoyed when people smirk when they meet us, or do so with their hands in their pockets, or can’t be bothered to look us in the eye. OK not usually murderously so, but could this annoyance have its roots in a far more violent distant past? Avoiding sudden movements and concealed hands would have indeed made a lot of sense to any weary traveller trying to make friends with someone who spends their time screaming angrily and cutting off heads with a blunt stick; concealed hands meant then, as they do now, possible concealed weapons or equally, signs of weakness and insecurity. 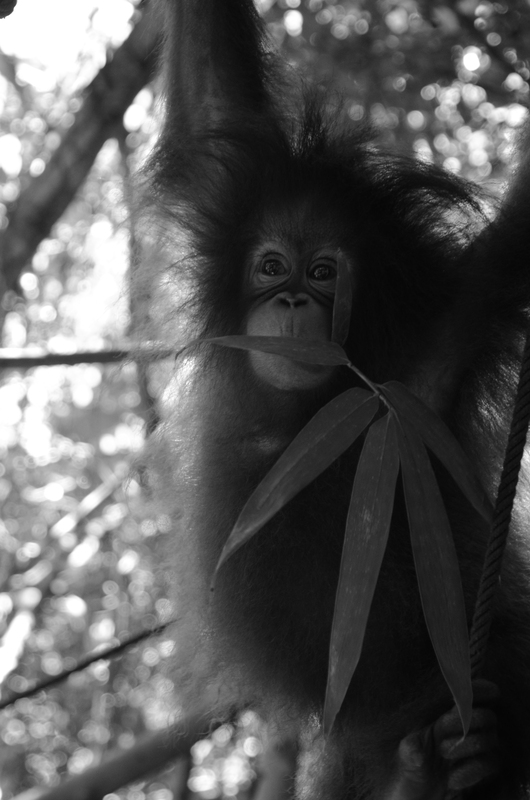 May primate species, Orang Utans included, bare their teeth as a sign of aggression or fear. We tend to think of this as a friendly gesture in humans, but when we consider that most toothy smiles are in fact directed at strangers or pretending to be amused and less toothy, broader smiles are used for people we have a close relationship with, or genuine humour, perhaps this is not so certain. In babies showing teeth is more closely linked to fear, and a broad toothless smile with signalling happiness or laughter. “In the primate threat, the lips are curled back and the teeth are apart–you are ready to bite. But if the teeth are pressed together and the lips are relaxed, then clearly you are not prepared to do any damage. These displays are combined with other facial features, such as what you do with your eyes, to express a whole range of feelings. In a lot of human smiling, it is something you do in public, but it does not reflect true ‘friendly’ feelings–think of politicians smiling for photographers. When do you smile? Is it really when you want to show someone warmth and friendliness? What kind of smile are we talking about? I gave this some thought, as I’ve just met a whole new bunch of teachers over here in China. Did I have my teeth apart, or clenched? Does that mean I was demonstrating territorial aggression, in the distant echo of a threat to bite if I felt my territory challenged? Or did I have my teeth together, to put somebody new at ease and re-assure them I wasn’t going to attack them? Avoiding smiling might have meant to a violent, aggressive head-hunting tribe that the signals I was sending were not of concealment of anything, aggression weapons or otherwise, and that I could therefore be trusted to enter their village safely and not find my head on a stick at the front porch.